Key skills: adaptive management, cumulative effects assessment, conceptual modeling, summarizing technical information for non-technical audiences, workshop facilitation, training, information synthesis, project management. Carol is a Senior Partner who joined ESSA in 1988 and has since worked on more than 240 projects addressing a wide range of environmental and natural resource management challenges in ten countries, for a diverse mix of government, First Nations, NGO and private sector clients. Much of her career has been dedicated to providing sound science-based information to decision-makers. Adaptive management is a major focus of her work, applied in various contexts including developmental/industrial impact reduction, ecosystem restoration, and endangered species recovery. She is passionate about helping clients learn how to use rigorous adaptive management approaches to identify and reduce the scientific uncertainties that will most affect their management decisions and improve environmental outcomes. She has helped develop adaptive management plans for the Middle Rio Grande in New Mexico, the Kitimat Valley and Elk Valley in British Columbia, and the Missouri River; and delivers training workshops and has co-authored several book chapters and papers on adaptive management. She is also keen to help improve how decision-makers consider cumulative effects, and believes in the value of undertaking cumulative effects assessment that goes beyond the single-project-based assessments required in most environmental assessment processes. She managed cumulative effects assessments in the Kitimat Valley and in Prince Rupert, which explored potential impacts of different combinations of emissions sources across multiple development projects to help regulatory decision-makers compare risks from alternative scenarios. She relishes working with clients who are facing difficult problems and are willing to be creative and visionary in solving them. Carol is a Registered Professional Biologist in British Columbia and holds a B.Sc. in Biology (with Distinction) from McGill University and an M.Sc. in Zoology from the University of Toronto. While at U of T she was awarded the George Burwash Langford Prize, given annually to the student who best combines excellence in research in environmental studies and contributes to the work of what was then the Institute for Environmental Studies (now called the School of the Environment). When not at work, Carol enjoys hiking, kayaking, fishing, wildlife-watching, romping with her dog, and taking far too many photographs in her remote coastal surroundings. 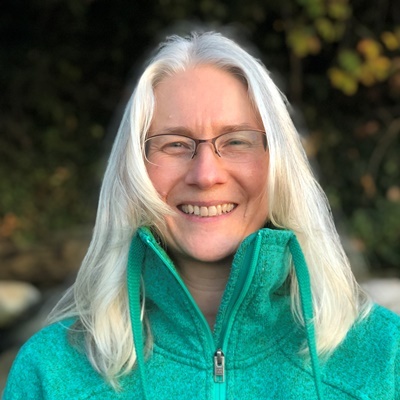 She is an active citizen-science volunteer in her community, collecting and analyzing data for Bird Studies Canada’s FeederWatch and NestWatch programs and BC’s first Breeding Bird Atlas, and for the Quadra Island Salmon Enhancement Society.